In 1936, a Frenchman was born who would have one of the biggest impacts on fashion and design in modern day history. His name was Yves Saint Laurent and whether or not you are into fashion, his story and the impact he had on clothing design can still be seen and felt to this day. The Denver Art Museum is the only museum in the United States to feature 40 years of his original work in an exhibit called Yves Saint Laurent: The Retrospective. Yves died in 2008 but the legacy he created was one that has captured the attention of woman (and men) all around the world for decades. He introduced some of the most provocative designs in the 60’s, the tuxedo suit for women, and was the first designer to use ethnic models in his runway shows. 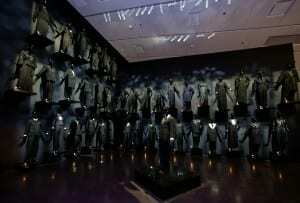 I had the opportunity of seeing this exhibit first hand and it was nothing short of amazing, if not moving. Not being a fashionista or having much background knowledge in clothing design, I was skeptical at first of how interested I would be in seeing this; but that skepticism changed dramatically as I walked through the exhibit. The walkthrough experience includes over 200 garments, photographs, personal items, drawings, and films that illustrate his impact on fashion which melds both design and art in extremely unique ways. The museum has done such an amazing job using lighting, themes, and displays out in wide open that you feel as if you are entering into Yves’ own private world. You begin to escape back to the 1930’s, 40’s, and beyond and you imagine these provocative, daring designs that are so carefully thought out, being worn by the wealthy elite who could afford them. As you walk through, the rest of the world seems to fade away and you are amazed at the tuxedo for women collection showing over forty different ways he created the tuxedo. Then you enter a huge hallway with glass walls on each side that display Yves’ own collection of fabric swatches; he had one of every favorite color but he had two of the color blue. When I learned this, I began to wonder if he loved blue because of his depression. Finally, as you near the end, you enter into a room that has this massive red carpet carefully placed on a stairway with mannequins all wearing his evening gown collection. It’s probably one of the most impacting sights of the entire exhibit. As you leave the room, there sits a glass case with a pendant displayed. This is the very pendant that Yves would place on one gown which he deemed his favorite during his fashion shows. It was simply amazing to be that close to the designer and a perfect way to end the exhibit. You don’t need to be a fan of fashion or design to enjoy this show because visitors experience it in various ways. And within the hallways of this show there are some surprises you really must see. Even if you have no interest or have never experienced a fashion event, this is an exhibit that will remain a memory in your mind for a very long time. Thank you to the Denver Art Museum for giving the BWE team a complimentary tour and letting us experience this spectacular exhibit. We heartily recommend making it a stop during your pre or post-TBEX time. 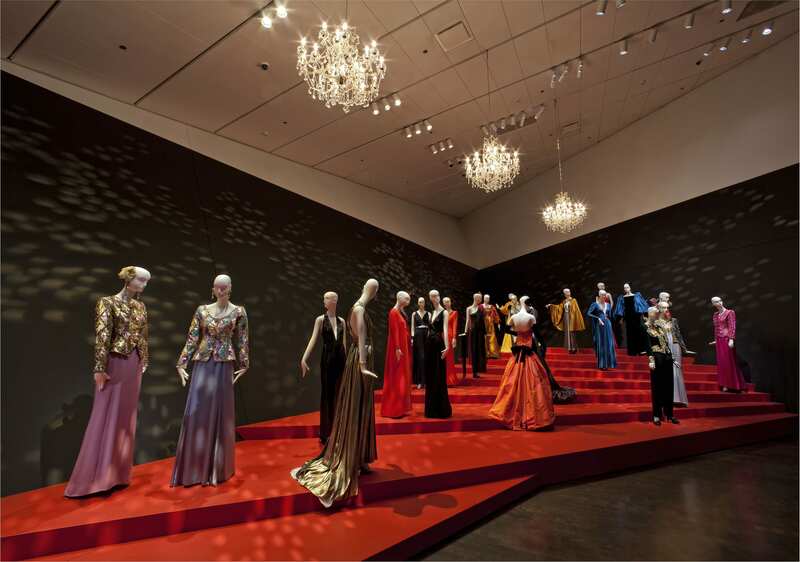 Yves Saint Laurent: The Retrospective will be on display at the Denver Art Museum March 25th – July 8th, 2012.